Indian Summer finds Ward skating the parking lanes of Washington Square Mall. He scores a dozen plates and an hour of exercise, but not without interruption. Ward crouches awkwardly, struggling to hold his camera at plate level. Shopper: Excuse me ... I have to ask. What are you doing? 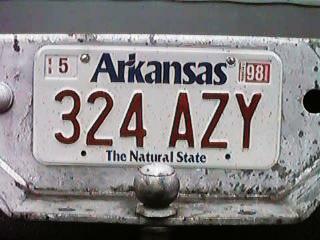 Shopper: You're taking pictures of license plates? Ward: Yea. I've got thirty so far. With the shot complete Ward notices that his explanation fails to satisfy. As he skates away he feels the need to fabricate further explanation. Ward: It gives me something to do while waiting for my family. Thirty minutes later ... Ward doubles back to the previous lane, gliding down its gentle slope, trying to avoid the circling patrol car. Officer: I'm going to have to ask you not to skate here. Ward: That's my car over there. The officer nods and smiles as Ward skates past the six lanes that remain of his circuit. Ward is still looking though, knowing he could drive back to pick up number thirteen should it be waiting for him in those last few lanes.